Enjoy using your piecing skills, or gaining piecing skills with this beautiful flower garden quilt. The pattern provides great instructions and tips. "This gorgeous Irish Chain variation really stands out and sparkles. 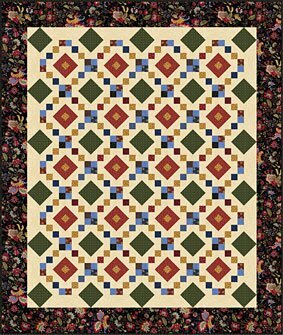 Smaller pieced squares set on point complement the simpler outside border, giving this quilt a pleasing over-all balance." Finished Size: 66-1/2" x 78-1/2"